1. Are the bull leapers men or women? 2. Some historians think the paintings of the bull leapers do not show something that people actually did because it would be impossible to jump over a bull that way. What do you think? The earliest Greek culture did not begin on the Greek peninsula. It began instead on a small island just south of the Greek peninsula. That small island was Crete, which was home to the Minoan civilization from about 2700 BC until the end of that civilization in about 1450 BC. Although the Minoans are very important because they were the first culture to develop in Europe and their culture formed the foundation for what became ancient Greece, we actually know very little about them. In fact, we are not even sure what they called themselves. The name “Minoan” is a name that historians have given to them. Historians got this name from King Minos, a character in a Greek legend about the island of Crete. Most of what we know about the Minoans was learned by studying the art and architecture of the ruins they left behind. For example, they built a huge, complex palace at Knossos, on the northern part of Crete. From looking at the art they left behind there, historians can tell that the Minoans thought that bulls were very important animals. They probably viewed them as having a special religious significance. The bulls might have been symbols for the gods. This special emphasis on bulls is probably due to the fact that bulls, because they are very aggressive, are often used to represent masculinity and virility. 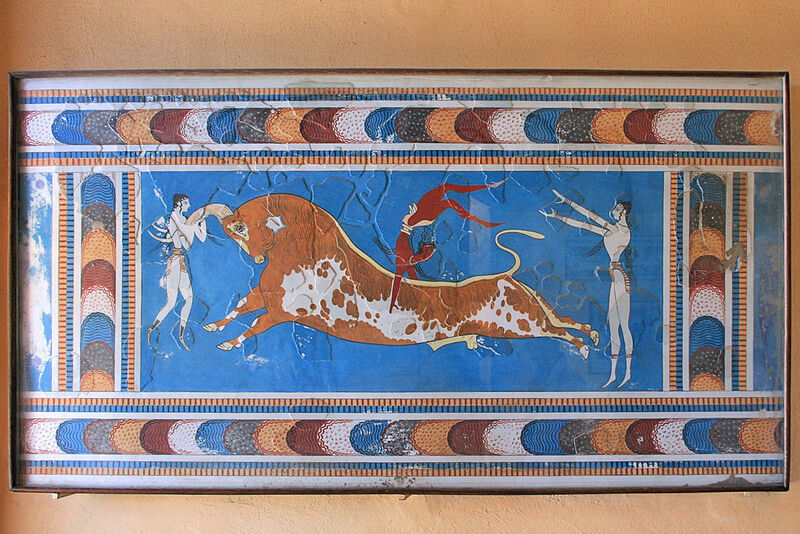 Some paintings left behind by the Minoans show young men and women jumping over charging bulls. This was probably a religious ritual of some kind. It is also clear from the art and architecture they left behind that the Minoans were very rich and powerful. Art in Egypt shows people wearing Minoan clothing presenting gifts to the Pharaoh of Egypt. At the time the Minoan civilization existed Egypt was a very powerful nation. If the Minoans were friends with the Egyptians, this shows that the Minoans were powerful as well. In about 1450 BC, there was a volcanic eruption on the island of Thera, a small nearby island. The eruption caused the sky to blacken and rain ash on the Minoans’ fields. As a result, many of the Minoans’ crops died. It also caused an earthquake that damaged their large palace and other structures. As a result, many Minoans died. Others fled from Crete never to return. Minoan civilization came to an end. At that time, another group of Greeks who lived on the southern part of the Greek peninsula were rising in power. This group, the Mycenaeans, used the decline of the Minoans as an opportunity to spread their own power. The Mycenaean civilization flourished on the Greek peninsula and on the islands near Greece, including Crete, from about 1600 BC to 1100 BC. The Mycenaeans spread their power by using new weapons they developed. These weapons were made of bronze, a metal that made their weapons stronger and deadlier than the weapons of the other peoples around them. When the Mycenaeans conquered Crete, where the Minoans had been, they began to admire Minoan culture and adopted many aspects of it. Through their conquests, the Mycenaeans spread Minoan culture all over Greece and the islands of the Aegean Sea. Eventually, however, Mycenaean civilization also came to a violent end. In about 1100 BC, a group of people called the Dorians invaded Greece from the north. Not much is known about the Dorians or where they came from, but it is clear that they were using weapons made of iron, a kind of metal that is even stronger than the bronze weapons the Mycenaeans were using. Following the Dorian Invasion, Greece entered into a 300 year period of warfare and cultural decline. We call this period the Greek Dark Age. While the Greek Dark Age was a period of great turmoil for the Greeks, Greece emerged more powerful than ever at the end. 1. 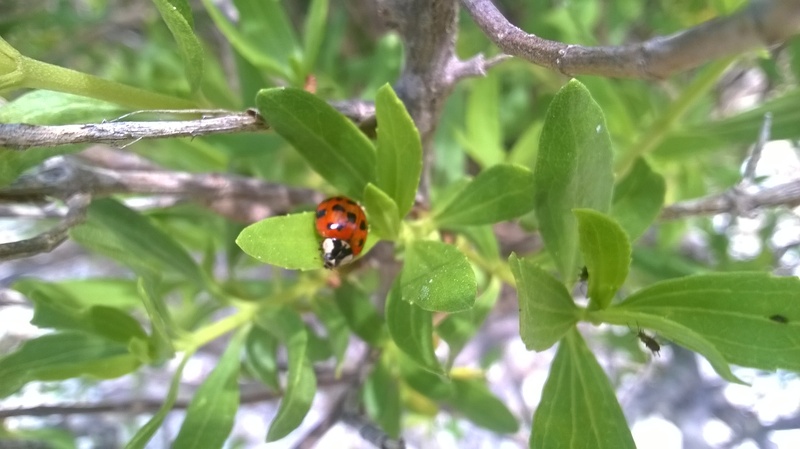 What animal was very important to the Minoans? Why was this animal important to them? 2. What kind of weapons did the Mycenaeans have that made them so powerful? 3. What kind of weapons did the Dorians have? 4. What do historians call the 300 year period between 1100 BC and 800 BC? Why do they call it that? But little lower than the gods and angels. Like people thrown out to delay the wolves. Wonders are many, and none is more wonderful than man; the power that crosses the white sea, driven by the stormy south-wind, making a path under surges that threaten to engulf him; and Earth, the eldest of the gods, the immortal, the unwearied, doth he wear, turning the soil with the offspring of horses, as the ploughs go to and fro from year to year. And the light-hearted race of birds, and the tribes of savage beasts, and the sea-brood of the deep, he snares in the meshes of his woven toils, he leads captive, man excellent in wit. And he masters by his arts the best whose lair is in the wilds, who roams the hills; he tames the horse of shaggy mane, he puts the yoke upon its neck, he tames the tireless mountain bull. And speech, and wind-swift thought, and all the moods that mould a state, hath he taught himself; and how to flee the arrows of the frost, when ’tis hard lodging under the clear sky, and the arrows of the rushing rain; yea, he hath resource for all; without resource he meets nothing that must come: only against Death shall he call for aid in vain; but from baffling maladies he hath devised escapes.